The Esplanade in Penang was supposed to be light on and there will be a lot of shouts from the crowds of tennis fan seeing the King Of Tennis event here. Though, it’s cancelled, no moe tennis for you and they are taking off the tennis court. From what I’ve known and read in the newspaper, the players were held back because the organizing side did not pay the enough sum of money that was required. So no players, no tennis, no event. State Municapal wanted it to be taken off ASAP. 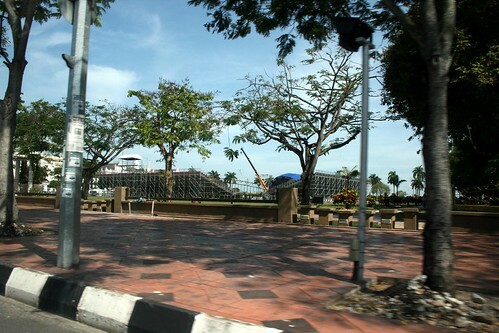 I passed by the Esplanade today and only seeing the people were busy removing everything.